INCLUDES FREE Florida State Filing Fees. OUR GOAL—YOUR Complete Satisfaction and UnderstandingOur goal is to provide each of our clients with as much information as possible about starting a 501(a) Non-profit Corporation. As you will see as you review the following material, there is a lot of information to digest and consider. Many legal aspects may be complex and confusing. We want you to know we are available to speak with you about any legal aspects of the formation of your 501(a) Non-profit Corporation at your convenience either over the telephone or in person at the Spiegel and Utrera, P.A., office nearest you. Your Articles of Incorporation, Corporate By-laws and other corporate documents must include the proper information to comply with Internal Revenue Service Regulations. Also, typically states have statutes that address specific types of entities, such as credit unions and other financial organizations. Spiegel & Utrera, P.A. will draft your Articles of Incorporation, Corporate By-laws and other corporate documents for compliance with the requirements needed to meet the definition of a tax exempt corporation at the federal level as well as for the specific type of entity at the state level. Or, if you have an existing non profit corporation where the Articles of Incorporation and other documents do not meet the requirements, we can amend your Articles and draft the appropriate corporate documents. The fee to prepare a Florida Non Profit Corporation with the required provisions for federal tax exemption as well as state compliance is normally $100 for one half hour of legal research and analysis at the Firm’s standard billing rate. Further research and analysis may be required, but it has been the Firm’s experience that extra fees may not be needed. Once your corporation is registered with the State of Florida, the next step in obtaining 501(a) qualification is to file the IRS’ Application for Recognition of Exemption under Section 501(a) of the Internal Revenue Code. Section 501(a) status would provide your non profit corporation with the benefits of public recognition of tax exempt status, which is particularly beneficial for obtaining grants; exemption from certain Federal excise taxes; and even non profit mailing privileges. The application process to obtain this tax-exempt status can be a very complex and tedious one. 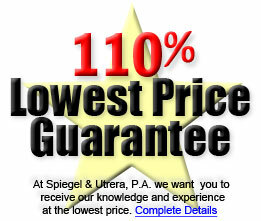 Therefore, we strongly recommend you seek the assistance of Spiegel & Utrera, P.A. in order to avoid any likely problems or undue delays in obtaining this status. We, at Spiegel & Utrera, P.A., are prepared to assist you in this application process in order to ensure you that all of the necessary documents are completed and submitted in compliance with IRS’ requirements. The typical application process may take 6 to 9 months. The fee to represent you in applying for formal recognition with the Internal Revenue Service is $1,500 (not inclusive of the IRS tax exempt application processing fee) if selected at the time of formation of your corporation, $1750 thereafter. Our services include assisting you in completing the documentation necessary for submission to the IRS as well reasonable assistance in responding to requests for additional information. If other services are needed, additional fees will apply. It has been our experience that in most cases additional fees are not needed. Non Profit Organizations such as religious, charitable, scientific, educational or veteran organizations, as defined in Florida Statutes, do not have to pay sales tax on certain purchases. Additionally, qualified religious institutions are not required to collect and remit sales tax on the sale or lease of tangible personal property. Let Spiegel & Utrera, P.A. prepare the required documentation for your 501(a) or religious organization to obtain this valuable tax status. The fee to prepare the documents is $35 when included as part of your incorporation package. If your corporation will engage in the solicitation of contributions from the general public, the corporation must register with the State of Florida and renew annually. This applies to tax exempt corporations. As mentioned above, it should be noted that unlike with 501(c)(3) charitable corporations, donors may not be able to deduct donations made to such tax exempt corporations. Our firm can prepare the registration documents for the Florida Solicitation of Contributions, the fee is $250 at the time you form your corporation. If you need a corporation immediately, we have many Florida corporations, both current year and aged, which are ready for delivery. This is the best option for clients who need a corporation within 2 business days. For more information and a complete list of all our Reddi or Shelf corporations CLICK HERE or call our office at (888) 641-3800 for details. If you need your Non-Profit Corporation formed urgently, for an additional $160. We will expedite the registration of the Non Profit Corporation and preparation of the Corporate Records and the Corporate Package will be ready the next business day, after receipt of payment. The regular processing time for a Non-Profit Corporation is approximately two weeks. The Non-Profit Corporate Package includes all the documents and the Corporate Seal.